Snuggle up on the couch or update your bedding with this excellent all season blanket from Superior. Crafted from 100-percent cotton, this blanket features a simple yet chic diamond pattern. Available in a variety of colors, this blanket looks charming slung over a chair or folded at the foot of your bed. I wanted a woven 100% cotton blanket with a tight enough weave to not snag easily and large enough dimensions to fit my king size bed comfortably, but without a price in the triple digits. This blanket is perfect! The diamond pattern is beautiful, and the color (I have ivory) is very nice. It's large enough - even after washing (cold) and machine drying (low) - to hang a good 8-10 inches over the sides of my bed, reach fully to the top, AND tuck in at the bottom. It's not loosely woven and doesn't seem to snag easily - our three dogs sleep in our bed, and after a few weeks' use the blanket still looks great. Soft and nicely substantial feel. Very pleased! This blanket is a heavy, good-quality cotton material. I ordered the king size for our queen size bed so there'd be enough material to tuck in between the mattress and boxspring. So I don't know how well it would fit on a king size bed. Be careful when washing and drying the blanket for the first time - the blanket leaves a TON of lint n the lint screen in the dryer. The only complaint I have about this blanket is the color. I ordered aqua, which is supposed to be a blue shade. It shows as blue in the photo. It is NOT blue! It is a seafoam green. Really ugly color and doesn't match our blue bedroom at all. Not worth returning though...didn't want to pay shipping charges just because of the color. This blanket is as promised - nice cotton with a diamond pattern. However, I thought I'd leave feedback on the grey colour. It is a very dark grey, but also a warm grey, almost taupe rather than a silver-toned grey. It doesn't go with the grey and white bedding I'd planned to pair it with, but think I'll use it in my beige bedroom instead as its a good blanket for the price. If you plan on matching grey with black and/or cool silver tones this might not be the right blanket for you. I love the weight, look and feel of the blanket. I'm just frustrated at the dimensions of the king size.....it just doesn't fit the bed properly, but every king sized blanket I buy is that way. They are too long on one side and too short on the other......so, no matter which way I turn it, it just doesn't fit the way I would like. I would like to find a blanket that drops down the sides of the bed about 8 inches or so and have enough at the end of the bed to nicely tuck in under the mattress. This one barely goes over the sides of the bed (so when 2 people get in the bed, at least one of you doesn't have enough) but is very long the other way, so if I rotate it, the sides are too long (hang below the edge of the comforter) and it's too short to tuck in at all at the bottom of the bed. It's frustrating to love the weight, feel and look of the blanket but not have it fit the bed right. I ordered the Superior All-Season Luxurious Diamond Weave Cotton Blanket in the Aqua color in the king size for my king bed. The color is beautiful and looks like the picture, but it is way too small for a king bed. I would suggest not ordering this blanket if you have a king bed, and order up for every other size bed. It has been washed many times over the last couple of years and doesn't even cover the top of the mattress completely, much less have any overhang at all. It is also not terribly soft for a cotton blanket. I ordered the same brand blanket in the Cotton Metro style for a queen guest bed, and it seems much softer and bigger than this diamond weave blanket. Love these blankets. I have the ivory and khaki ones. I have a full bed but I ordered twin blankets so I don't have so much overhang off the sides. The twins leave about 6 inches per side of the bed. Love the colors, design and quality. So glad I chose this brand and style. I would highly reccomend them. I ordered the king size, because I knew 88 inches would be too short to tuck in on the sides of my thick queen mattress. Well, the sides are long enough, but the bottom only gives me about an inch to tuck in, and this is a king blanket on a 12" thick queen mattress. Would be nice if it was another 6 inches or so. Quality seems ok, nothing special. Good for the price. I love this blanket! I bought this because my new foam mattress was too warn for sleeping. I was told all cotton bedding would solve this problem. It made a huge difference. I purchased this blanket in black. It is elegant and goes well with my comforter. It has a tight weave and the diamond pattern is pretty. The blanket is mid weight. I've had no shedding. I have a 12" mattress and it drops down about 4 inches on both sides. I have a king mattress and most blankets barely cover it. I could not find a blanket as nice as this in the store especially for the price. Shipping was fast and I am very pleased with this company. Will buy from them again. 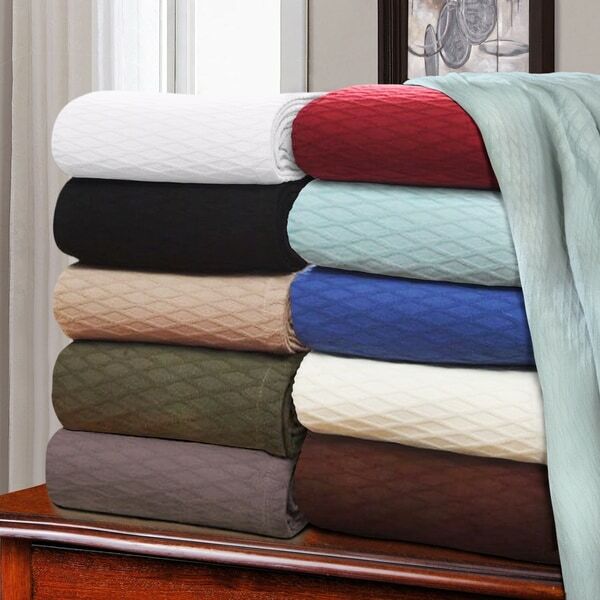 I bought the Superior All-season Luxurious Diamond Weave Cotton Blanket for three different bedrooms. Unfortunately, the blankets are neither luxurious nor soft. Very happy with this purchase. The color is as shown. I purchased the "seafoam" color for a king size bed. Even after washing and throwing it in a dryer, the size is generous and hangs over the mattress on all three sides by 14 inches. It is lightweight but it does not stretch out of shape. Love the diamonds in the pattern. We bought these in chocolate to cover cushions on our sofa for our dogs. They are thick and stiff and perfect for the job. The pattern is really beautiful, and they've yet to snag with 3 large dogs. They are thick enough so the dog hair doesn't go through them either. We have a Chocolate Lab and 2 Pibbles. It took forever to find a black cotton blanket .. and, it was well worth the wait and the search to find this one! The weight of the blanket is substantial, and the diamond pattern is just beautiful. It is the perfect finish at a very reasonable price. I highly recommend this blanket. It really is a lovely addition to my bed. Was looking for a light well made summer blanket. Hard to tell quality and feel online but took a chance. Was not disappointed. It is beautiful. I love this blanket. It is lightweight, yet keeps me warm on these cooler nights. It looks great also. I have been looking for an all cotton nicely woven blanket for a long time. I was surprised just how hard they are to find. Reasonably priced ones were always cheaply made and any of quality cost at least $100+ for a queen sized bed. I can't say enough about the quality of this blanket! The perfect weight for all seasons. A beautiful weave, nice cotton. I bought a king size to account for shrinking after first wash. I will warn you that the first washing and drying generates ALOT of lint in the dryer lint trap! But, in no way did the blanket lose any plushness. I am planning to buy more for gifts. At this price and quality, it's a can't miss! I bought the King Size blanket which is too small for a King bed. The material of the blanket is rough, definitely not luxurious. The blanket is a nice weight and the black color I ordered is rich looking—not faded at all. I washed before putting on bed and no problem—looks and fits perfect on queen size bed. Very nice breatheable cotton blankets. I am using them on twin trundle beds as needed for a textural bedspread and also for warmth,so it is very cost effective as well as attractive and useful. The texture is a heavy raised diamond shaped crisscross pattern which is hard to find in stores, so I appreciate the choices Overstock affords us. Love shopping here! Perfect weight not to heavy or too light. Color is exactly as shown and looks wonderful on my bed. I love all cotton blankets. I’ve washed them several times and they haven’t shrunk or faded. Not too heavy. Perfect for CA! "Is the burgundy color really burgundy? It looks very red on my screen." "I am wanting the twin size in white or grey. Do you know when these will be available? Once the allowance for shrinkage, would the full/ queen be too big for a twin bed?" The twin size in white and grey are expected to be back in stock early to mid February. "I have an old 100% cotton blanket that Is impossible to wash. it’s so heavy when wet that the machine doesn’t spin. Has anyone washed this blanket and how did that work?" I've washed it in my aging front loader and had no problem at all. The blanket is fairly lightweight -- but nice. "Is the burgundy blanket red or burgundy?" "Is the white blanket a bright white or more of a natural white?" It is a muted natural white. I don't know as I ordered the taupe-colored blanket. I'm sorry I couldn't answer your question. It is more of a natural white. "On my phone, the chocolate color looks like it's sort of a cinnamon/chocolate- like it has a bit of a lighter spice color to it. Would you say it's a true chocolate bar color, or more of a spice/brown? Thx! " I would say that because this is a cotton blanket, the color may become lighter with time. I purchased the red one, so I'll expect mine to lighten with time. It is a warm brown color. I got the Black version... I may not be able to advise you about color, but I have washed it several times and there has been NO fading whatsoever... ...also, I have to say that I have been THRILLED with all my purchases from Overstock.com and even more so from **** as well!!! "Hello everyone just curious if the grey is a super dark grey? Looking for a lighter color, warm tone gray. Someone mentioned it IS a warm tone but very dark. Just curious if others agree. Thanks!!" I purchased this gray blanket, and while I love the blanket itself, it's really not gray. It's more on the taupe-y side. Not like it's pictured. It's a great blanket though and I kept it for the winter months at the end of the bed to pull up on chilly night. It's very soft and washes well. It is a darker gray, but is a warm tone. Love the color myself.